A high level public- private sector dialogue on ways of supporting and promoting private-sector led growth in Africa will take place on Tuesday, January 30, 2018 in Addis Ababa, Ethiopia. 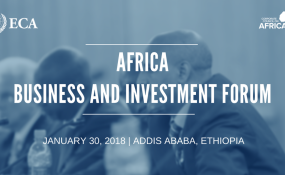 The African Business and Investment Forum will serve as a platform for African and U.S. private sector executives to share insights with African heads of state, ministers, senior USG officials, representatives of multilateral institutions and other stakeholders. The one-day Forum will feature roundtable discussions on issues related to trade and diversification, energy, agribusiness, and health. This will ensure that private sector voices and views are heard by leaders and key stakeholders, and that the day-to-day challenges faced by private sector operators in Africa are addressed. Among the more than 150 expected participants are Prime Minister Hailemariam Desalegn of Ethiopia; President Filipe Nyusi of Mozambique; President Paul Kagame of Rwanda; President Alpha Condé of Guinea; President Macky Sall of Senegal; President Yoweri Museveni of Uganda; President Mahamadou Issoufou of Niger; President João Lourenço of Angola; and President Uhuru Kenyatta of Kenya; CEOs and senior executives of key U.S and African companies, both multinationals and SMEs will also attend. In addition to providing a platform for a high-level public-private sector dialogue, the objectives of the Forum are to increase opportunities for business partnerships, secure commitments as well as track the adoption of business-friendly policies, and showcase countries and policies that are contributing to an enabling environment for enhanced African regional and global trade and investment, including with the United States. The Africa Business and Investment Forum is organized by the Corporate Council on Africa (CCA) in partnership with the United Nations Economic Commission for Africa (ECA). ECA’s Executive Secretary, Vera Songwe, and CCA’s President and CEO, Florizelle Liser, will be representing the two organizing institutions at the event. CCA, as the premier U.S. business association solely focused on promoting U.S.-Africa trade, investment and business engagement, will bring its 23-year expertise of successfully providing insights, connections and access critical to U.S. and African businesses operating on the continent. ECA provides a unique platform for intermediation between the public and the private sector policies and programs, offering solutions and support to accelerate sustainable private sector development on the continent.